There are free rpg's and there are open source rpg's. And then there is EABA. 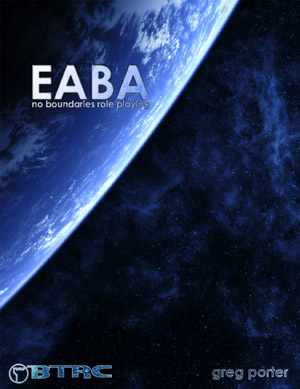 EABA is fully hyperlinked, color-coded, indexed and organized into 150 pages of role-playing goodness. And if you don't have access to color printer or won't be reading it from a computer screen, we've got a grayscale version optimized for laser printers. Don't let the plain cover image fool you. We've got a dozen full color alternate covers in high and low resolution on our web site. Choose the one you want to customize your game! The version includes both the color and grayscale versions of the EABA version 1.1 pdf.